Ask whoever is sitting next to you to name a board game. Did they name a competitive game? Chances are, they did. In the world of analog gaming, competitive games have been around over a thousand years. From the first game of mancala was played in the dirt, to the chess tournaments going on as you read this, competitive board and card games have been the norm. Although there are likely many reasons for this, one compelling argument for why there are so many competitive games is that competitive games with symmetric starting conditions are much easier to design than other types of games. A designer working on such a game doesn't need to worry about the difficulty of the game: so long as there is a player with a similar skill level to you, the game will be challenging, but not too hard. It's no wonder, then, that cooperative games, or "player(s) vs. system" games are a relatively new phenomenon. 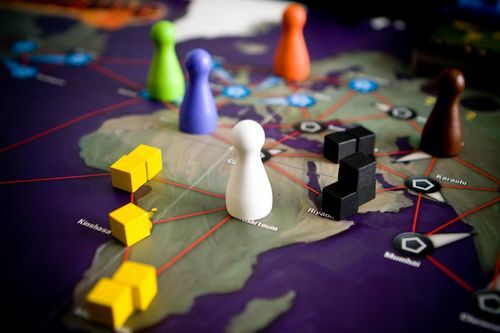 The benefit of these games is that they offer new types of gameplay over traditional symmetric competitive board games. They can appeal to players who don't enjoy being cutthroat, to players who have groups with mixed levels of gaming ability, or to players who simply like playing alone. Cooperative games do, however, have several drawbacks. The drawback that I'm going to talk about here is what I call the "piloting problem." The piloting problem exists in games in which multiple players are working collectively to overcome a system. The problem is this: a player with more experience than her allies will often tell them all what to do in order to win. A game in which this happens ceases to be a team game. If a team consists of two new players with a pilot, the pilot is basically playing by herself, albeit with four extra hands. The problem tends to occur in groups with mixed skill levels (and let's face it, that's most groups), and can happen in any game with teams (not just purely cooperative ones). Finally, the piloting problem is a tricky one, because it's a problem of degrees. There's nothing wrong with one player directing the strategy for the group. It becomes problematic, however, when that player just starts directing the group. These rules are intended to require any would-be pilot to stop and collect feedback and opinions from her team before telling them what to do. In reality, it often just adds another step (the divulging of information step) before the pilot makes her final decision about what the team should do. In general, this way to prevent piloting is more clunky and artificial than actually effective. Battlestar Galactica and Shadows Over Camelot both feature "role cards," which tell the players whether they fight for the good guys or the bad guys. Sometimes there are no bad guys at all, and sometimes one player is secretly working against the others. This is a clever way to get rid of the piloting problem: what if the person who's telling you all what to do is really working against you?! In practice, however, it doesn't work quite that well. As long as there are two players of fairly high skill, one should be able to tell if the other is making bad suggestions. Usually in these games the elements of subversion happen in hidden ways (such as allowing one player to see two cards and choose one of them, or having players contribute cards to a pool face down). Because of this, it's actually pretty likely that even if the pilot is working against the group she would still direct the group as though she were on their side for fear of being caught. If there's only one experienced player in the group, I often find that inexperienced players will listen to her even if it might not be in their best interest. In short, the traitor solution is a cool mechanic, and has some mildly positive effects on the piloting problem, but is not the be all end all. In addition, this mechanic often heavily determines the feel of the game, so it's not something you can just add on to a coop game that has a piloting issue. A skill ceiling is the highest possible ability a person can achieve at a game. Depending on how long it takes to reach this point, a game can either have a low skill ceiling or a high one. One way to circumvent problems of piloting is to remove the skill difference between players. If all players are at the same skill level, then none should be able to have better suggestions than the others. Two examples of this are POX and Forbidden Island. Both have such low skill ceilings that it takes only two or three play throughs to master them. In POX's case, each game is under 15 minutes, so a pro and a first time player can be on the same level within an hour, and they can both debate the efficacy of different possible moves, instead of having the pro dictate the efficacy of particular moves. The most elegant solution I've seen to prevent piloting is simply giving players so much to do that they can barely play their own roles, let alone anyone else's. The easiest way to do this is making a game real time, like Space Alert. In Space Alert, players are actually encouraged to pilot the other players (the game is all about coordination and good leadership helps) -- assuming they have enough time. And that's a big assumption; the game is played in real time, with each player scrambling to get her cards down, in the right order, and coordinated with the other players by the end of a 10 minute soundtrack. It is simply impossible for one player to pilot the others in any overbearing way. In order to have time to do so she would have to neglect her own character's actions. Of course, this solution cannot be applied to most games, as adding real time elements, like adding a traitor, is not something to be undertaken lightly.